Plumbing is in our blood! George's Plumbing Inc. was established in 2009. George Kirkhoff III and George Kirkhoff IV (formally of Kirkhoff Plumbing) have created this company to provide the best service possible to our customers. We embrace every customer we have and will do what it takes to please them all within reason. *Very small company of 3 Indiana State Licensed Plumbers all from the Kirkhoff Family. Most service companies send out apprentice plumbers or salesmen to sell you as much as they can. Not us were there to fix the problem right. We know by doing so you will call us back for future problems. Thats our goal to make you a customer for life. 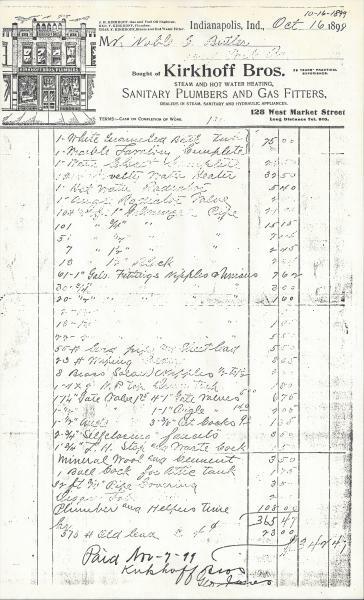 *As you can see form the receipt The Kirkhoff family has been plumbing in Indianapolis since the 1800's. We know what we are doing. The trade has been passed down from generation to generation with no gaps in any generation. This is very special to us and will not find this with any other company. *Owner George Kirkhoff IV Ball State, Miller college of Business, Alumni and Licensed by the State of Indiana as a Plumbing Contractor. An owner with both business background and plumbing background is very hard to find. This ensures your getting a Plumber that will be around to count on. *Knowledge and experience. Between the 3 of us there are over 60 years of on the job experinece. Each of us started at a very young age working for the family trade giving us an advantage on age to experience.